Disney Marathon | Run S.M.A.R.T. 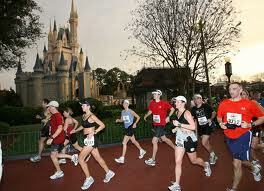 Jack Daniels Training Plan customer Kelly Paul of Fairfax, VA set a new PR at the Disney Marathon. Kelly finished in 4:48:23 under warm conditions. Based on Jack’s calculator temps in the high 60’s slowed her down by roughly four minutes. Her previous PR set back in 2010 was 4:52. Jack Daniels Training Plan customer Rowan Jones of Waverly, KY ran the Disney Half Marathon and Disney Marathon on back to back days last weekend. On Saturday Rowan finished the half in 1:28:00, a new PR by 18 minutes! The following day he came back and ran the marathon in 3:12:22, a 37 minute improvement from his previous marathon best. So, the question is, how fast could he have run the marathon in without having run the half the day before? Run SMART client Mitchell Thornton won his age group at the 2009 Turkey Trot 5 Miler in Warren, OH. Mitchell ran 29:07 (5:49 per mile) winning the 16-19 age group by 25 seconds. (Full results). Run SMART client Tim Bradley got 20th place at the 100th Thanksgiving Day Race 10k in Cincinnati, OH. Tim managed to run 33:09 (5:21 per mile) amidst his build-up for the Disney Marathon in January. (Full results). Both clients work with Dr. Jack Daniels.